Controller 1 works fine with Mari0. But when I go to set up the buttons for controller 2, the game doesn't react to the button presses. The controller works fine in other games. Any ideas? I would really appreciate advice. I assume both controllers are then detected fine in the Windows gamepad control panel? Are they the same model? 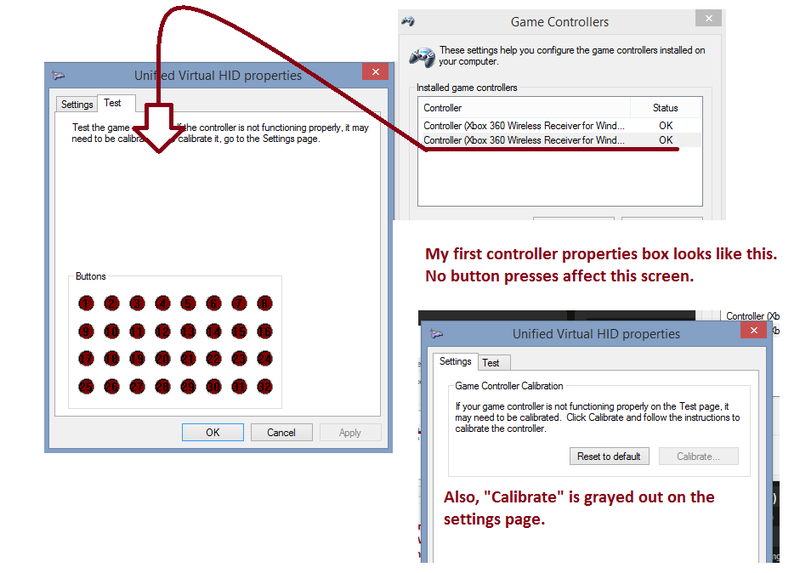 Sašo wrote: I assume both controllers are then detected fine in the Windows gamepad control panel? Here's a video of me trying to set the buttons in Mari0. As you can see, the first controller is seen fine. But no matter what I press on the second controller, nothing is detected. When I initially did this, it was with 2 wireless controllers. Just as an added experiment, I used two wired controllers. Now, the opposite is occurring. The 2nd controller (the 2nd player LED is lit up on the controller) is being seen as JOY1 under the controls. Pressing buttons on the first controller isn't doing anything. Try opening "joy.cpl" and see if both are there in the panel. Then go into setting and see if inputs of both work. Several libraries were updated in the latest Löve and it's likely the best chance of making sure both controllers work. Well that's weird... i'm using 2 wired controllers now, and controller 1 is giving me this error. Controller 2 let me test the inputs. How could there be something wrong with controller 1, it works fine in Steam and all other programs. Very weird. I'll try plugging it into some other USB ports. Okay, I tried plugging it into a different USB port. Still got the same error. So then I tried unplugging Controller 1, but keeping controller 2 plugged in. Then I turned on my wireless controller again, so it became controller 1. And in joy.cpl, the wireless controller 1 works fine, but now the wired controller 2 is giving me the error... which makes no sense because it was working fine 30 seconds ago. It's like my computer won't let 2 controllers work together at the same time or something. I find that really bizzare. When we used 4 quasi-xb360 controllers at gamescom, they worked with zero configuration. Did you install any drivers for the controllers (at any point at all) or did you just plug them in? Can you maybe try connecting them on a different computer? I think I installed some kind of drivers from Microsofts website. I'll try them on a different computer tomorrow. Still having issues. in fact I'm having issues with all my emulators, there has to be some deep issue going on in my computer. For example in my NES emulators, it sees the inputs from my first controller as Joy 2, and my second controller as Joy 0. Makes no sense. And also really annoying because when controller 2 is OFF, controller 1 changes from Joy 2 to Joy 0- which means player one's button configurations don't work for me (because they've all been assigned to work with Joy 2). What I'm trying to get at is, I have some real issue here. 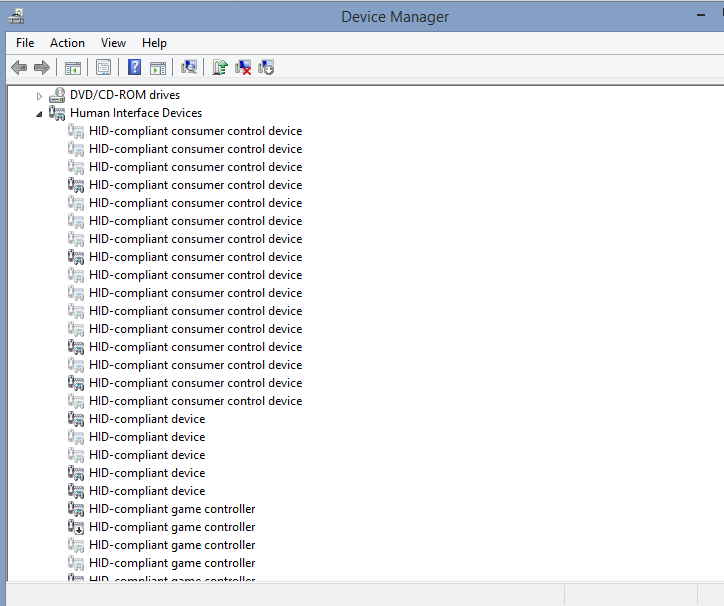 If possible, you should remove every single game controller from your device manger (also uninstall them and make sure to have hidden/inactive devices displayed). Then you can start with a fresher slate and see if it still happens. 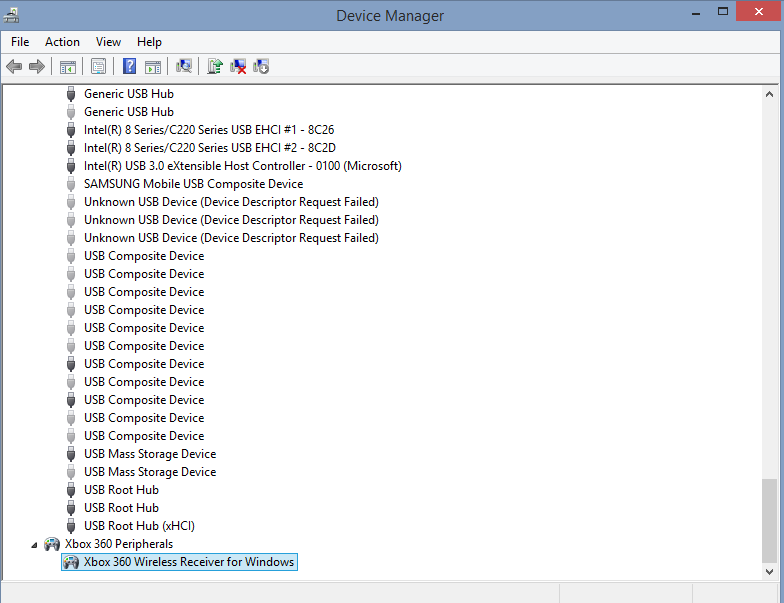 What about all those USB devices? Could they be messing something up? Also I have a lot of HID's, could they be messing something up? I'm a little weary about uninstalling ALL of them, I'm not sure what most of them are, but I'll do it if I have to. Edit: Here's something strange I've noticed but never mentioned before. In the controllers properties window, with both controllers on, it lists the first controller I turn on second, and the second controller I turn on, first in the list. I don't know if there's any significance there. 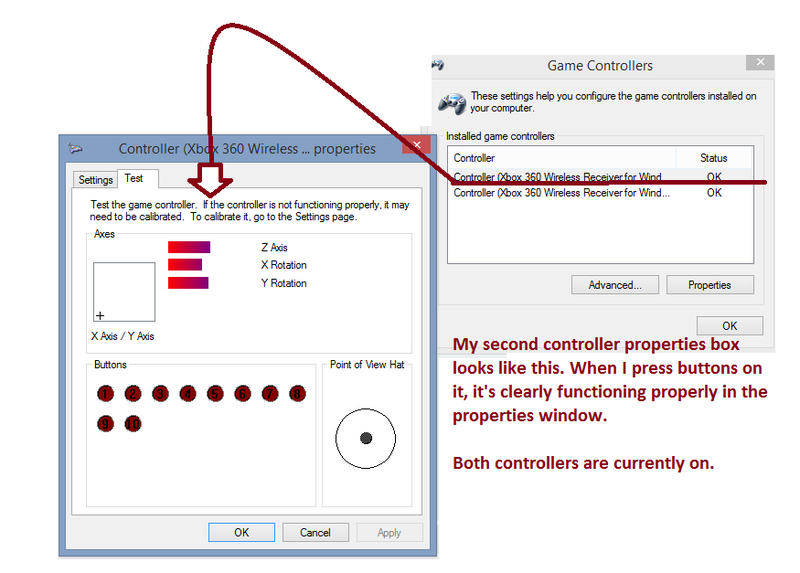 The properties window for controller 2 appears normal. These controllers work great in local multiplayer Steam games, but malfunction in emulators and Mari0 for some reason. Edit again: Well, this is interesting. I turned off both controllers. I then turned only ONE on, the one that had the messed up properties window. Then I turned the other controller on. The properties window that looked fine before is now not responding to the first controller. It's responding to the second. WIndows is changing the Joypad ID of the controller once a second one comes on apparently. I have no idea why it would do this. - Find the second one that was only unhidden and uninstall drivers for that too, then restart the machine and once booted, plug both in. Probably the steps I'd take.